The sport Dungeness crab season kicked off this past Saturday, and those who ventured offshore reported the crabs were plentiful and good-sized, and much meatier than last year at this time. Captain Tim Klassen of Reel Steel Sport Fishing set gear south of the entrance this week in 90 to 120 feet of water and reported 18 to 25 keepers per pot following an overnight soak. “The reports were similar for boats fishing south of the entrance as well as those who dropped pots right outside the jetties in 60 to 70 feet of water. Reports coming from the bay were mixed. I heard some boats did well, and some got skunked. It sounded like they weren’t everywhere, but if you fished in the right spot you could do well,” added Klassen. Opening day reports from Trinidad were about the same as Eureka – plenty of crabs and a little better grade than last year. There were no shortage of kayaks and small boats which is usually the case on opening weekend. Limits were the norm for just about everyone on a three-hour soak. Reminder: State waters from Patrick’s Point, Humboldt County (41° 8.00’ N. Latitude) north to the California/Oregon state line remains closed due to unhealthy levels of domoic acid. Testing for domoic acid is continuing, to view the results, visit here. On Sept. 28, the Friends of the Eel River, a local non-profit organization based in Eureka, filed a petition with the California Fish and Game Commission to list Northern California summer steelhead under the California Endangered Species Act, as an endangered species. 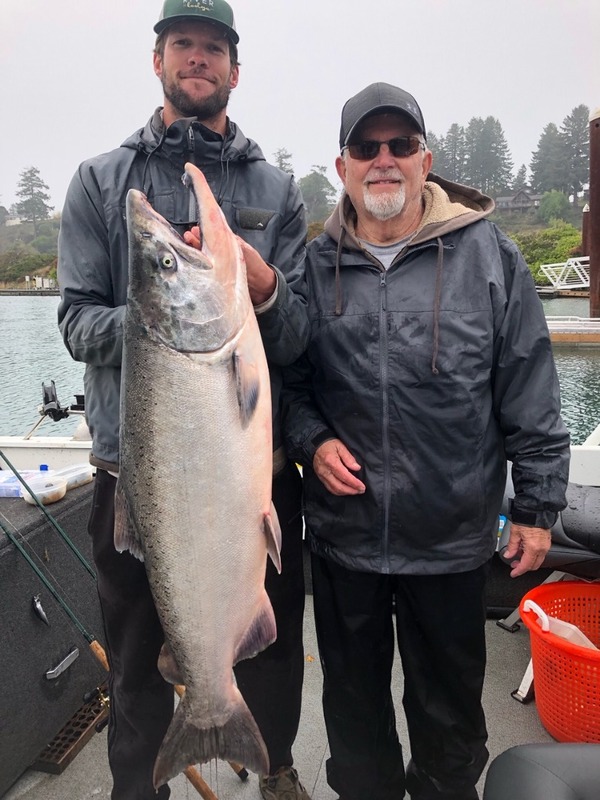 The organization stated that the California summer steelhead are a native subspecies of fish in serious danger of becoming extinct throughout all of its range due to causes including loss of habitat and change in habitat. The Summer steelhead are stream-maturing ecotype fish that enter freshwater with undeveloped gonads, and then mature over several months in freshwater. These steelhead spend the summer in typically deep, bedrock holding pools and remote canyon reaches of streams with some overhead cover and subsurface flow to keep cool until higher flows arrive in winter. How will this listing effect the current situation with the Potter Valley Project, which PG&E has recently put up for auction? “There are currently two scenarios right now in which the PVP could be transferred to an owner other than PG&E, said Scott Greacen, Conservation Director of Friends of the Eel. “In the first, PG&E’s current efforts to “sell” work out, and the new owners get the whole setup as it now exists. In the second scenario, the auction fails, and PG&E winds up negotiating a deal to remove at least Scott Dam. In that case, it’s likely that a new entity would be created to take ownership of the PVP while dam removal happens – and, most likely, to manage what remains of the PVP as a winter-only water transfer project. What listing will do is make more explicit what’s at stake in the question whether to remove Scott Dam, and/or to relicense it, as FERC is currently in the middle of doing,” said Greacen. “The summer steelhead that ran up the mainstem above Scott Dam were the longest (distance from the Pacific) run of steelhead in the region. If the upper mainstem run could be restored, the regional population would benefit enormously by gaining another robust population, adding to the Middle Eel and the Van Duzen populations that are now our best hope to keep these fish from blinking out.” It would be easy to believe that the FOER filed this petition to secure more water as the summer run is migrating. But that’s not the case according to Greacen. “There’s a common misunderstanding that the key issue for fisheries in the Eel is summer flows. It’s not. Summer flows are higher now than they would be without the dam (because NMFS requires basically a natural flow equivalent, plus a smallish buffer). What Scott Dam removal would give the fish, especially steelhead, is another 200 plus miles of high-quality spawning and rearing habitat above the “Lake” Pillsbury reservoir, as well as what looks like some great habitat now under the reservoir. The Fish and Game Commission will receive the petition at its December 12-13, 2018 meeting in Oceanside. It is anticipated that the Department’s evaluation and recommendation relating to the petition will be received by the Commission at its February 6-7, 2019 meeting in Redding. Interested parties may contact Kevin Shaffer at Shaffer@wildlife.ca.gov. To read the entire summer steelhead petition, visit here. For the trapping week of Oct 29 through Nov. 4, 9 jack Chinook were trapped at the weir. To date, 291 jacks have been trapped compared to 865 for the entire 2017 trapping season. This past week, 28 adult Chinook were trapped, bringing the season total to 1,234. In 2017, 1,030 total adult Chinook were trapped. There were 5 adult Coho trapped last week, the season total is now at 20. In 2017, 30 adult Coho were trapped. The steelhead numbers picked up this week compared to the previous week. A total of 54 adult steelhead were trapped during the week of Oct. 29 through Nov. 4 The previous week 7 were trapped. For the season, 527 have been counted compared to 689 for the entire 2017 season. According to Mike Coopman of Mike Coopman’s Guide Service, fishing on the lower end of the Smith has slowed down the last few days. “We have some pretty big tides right now, so I think the fish are able to move through the Sand Hole pretty easily,” said Coopman. “There hasn’t been much angling pressure, but there’s a lot of seals around. I think they’re working the fish over pretty good below the hole, and the fish are just blowing through. The rain we had last week moved a lot of the fish out from the lower river, and I don’t think as many moved in,” added Coopman.